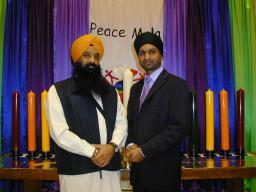 Guru Nanak Sikh Community Centre has been involved with the Peace Mala since its launch in November 2002. Our organisation acts as one of the key Black and Minority Ethnic (BME) organisations in the area, catering specifically for the needs of the local Sikh community. Our services, particularly of a multicultural nature, are often utilised by the BME communities at large. The Peace Mala supports our cause for greater tolerance and for social, as well as cultural, integration within the local community. The work of the Peace Mala embraces the rich cultures of all world faiths and promotes tolerance amongst us all. I have personally been involved with the Peace Mala ever since its launch in 2002 and I am pleased to see it grow and its awareness flourish, both locally and nationally. I am delighted to work with the Peace Mala, which promotes such open dialogue amongst BME communities. Peace Mala highlights the issues of World Peace and Social Tolerance, not only within BME communities but also to a wider audience.